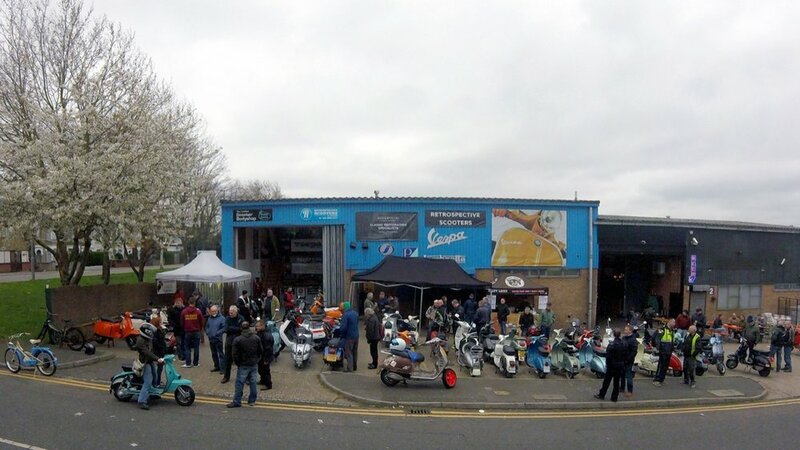 I was working and unable to get along to this but Aaron James of Retrospective kindly sent in these photos and words..
“April 6th saw Retrospective Scooters and The London Scooter Bodyshop hold their annual open day. The weather held out to see a great turnout of some truly beautiful and unique scooters. With the imminent start of London's Ultra Low Emissions Zone (ULEZ) the following Monday, Retrospective were keen to showcase their electric conversions for classic scooters. Those lucky enough to get a turn could not help but smile after test riding the electric converted Vespa Primavera and Lambretta GP. The day also saw a wide variety of scooters from new Niu electric scooters and Royal Alloys for sale, to classic Vespas and Lambrettas, all in a range of different styles. There were Vespa cut-downs, Mod inspired machines, mopeds from the 1940s and many more great looking scooters. Wildcard Brewery served up some tasty pints next door, whilst Salty Lions offered up some delicious BBQ delights to vinyl spun by Bradley Hall - all making for a fantastic afternoon.” Words and photos by Aaron James.